The Beholder is one of the classic D&D monsters, and necessary for any collection of fantasy miniatures. I own two old school Beholder miniatures. The first figure is my favorite. It is from Grenadier's Dwellers Below boxed set (2012). It looks exactly like the Tom Wham illustration of the beholder from the AD&D Monster Manual. 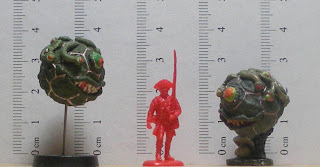 The smaller Beholder is a 15mm Beholder made by Ral Partha for the AD&D Battlesystem line. This particular figure was from the Chipco Evil Army set. I'm almost positive that it is the only Beholder in 15mm. I wanted to take the Grenadier Beholder and mount it on a flying stand, but the miniature is so heavy, that it would have tipped almost any stand over, so I resorted to the Dark Art, and created a duplicate in resin. 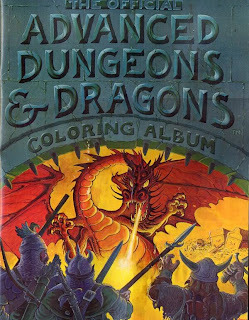 Well, the appearance of my Beholder is probably not what Gary Gygax had in mind, but at least I know where the color scheme came from now. Don't feel bad, that same coloring book had me convinced that Hobgoblins looked like Mandrils for a good year or so. There's only one beholder in 15mm? Ugh. If they are such a classic creature, then why are they so rare in all scales. Does Wizards of the Coast have copyright on the whole idea of a floating eye monster? 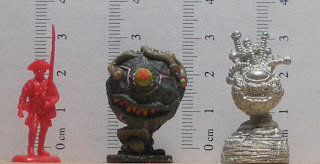 I was trying to find a beholder for 28mm, and the few I could find were mucho dinaro. According to Wikipedia, WOTC claims the beholder as "product identity". If you're looking for the old Ral Partha AD&D beholders, then yeah, they can be quite expensive. 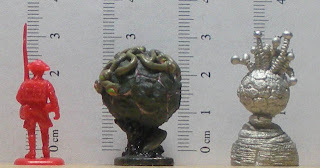 DDM prepaints, and Reaper Minis have beholders that aren't too expensive. I usually get my Reaper stuff from Miniature-Giant at 26% off with free shipping. I also remember someone on TMP who had a blog article about making a beholder from aluminum foil and putty. Might be worth it if you only need a single beholder.